Grab a large piece of aluminum foil; about 18 inches long. Spray one side with non-stick cooking spray. Scrub potatoes, but do not peel. Slice thin. Dice an onion. 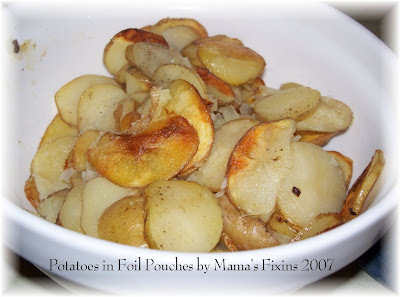 Place potatoes and diced onion on the prepared foil, keeping them to the center. Dot with a pat or two of butter. Sprinkle with salt and pepper. Fold the ends of the foil to the middle. Take the opposite two ends, and bring those to the middle as well. Make sure the foil is sealed well. Place in a 350 F oven, on a cookie sheet. Bake for about 1 hour. You can also throw the pouch on the grill. Either way, the potatoes turn a lovely golden brown, and taste wonderful! Tracy, I do the exact same recipe! But I've always made individual packets and thrown them on the grill. Not everyone in my family likes onions on theirs, so I custom make them. Sometimes, I will add seasoning salt to them, too.